This is a project via Nicola Greene to assist International NGO, Water for People with their work in Uganda. The NGO install latrines in various urban and rural areas in Uganda. They have been having an issue with the fill rates of the latrines and are wanting to get real data on the use of the latrines. This means recoding visits to the latrines and counting the number of flushes made. Knowledge of the volume and weight of the deposits made each visit would be an added bonus. See Counting Poo/Ideas for a record of possible project enhancements. Produce a prototype to monitor a 'flush' event and record that data. Mechanical Flap A hinged/moving cover on the waste pipe outflow that is moved by a flush. Simple and robust. Low or zero power. Risk of causing blockage. Metallic components will corrode in high humidity/heat? Can waste be completely eliminated from getting in the way? With knowledge of the dimensions of the pit, this will allow volume calculation. Likely to be incompatible with "tiger worm tray" composting addition? The basic circuit was a 10K thermistor and 10K resistor forming a potential divider. The voltage was measured with an oscilloscope/Arduino. A thermistor placed on the outside of the pipe is not suitable. The pipe conducts heat too slowly, and the heat transfer for one flush is very low. A thermistor placed within the pipe (as flush to surface as possible) was more successful. A large voltage change was apparent when a flush occurred. With careful design to mitigate risk of blockage due to obstruction in pipe, this method shows promise. The requirement that there be a temperature difference between waste and ambient remains a concern. This method may have to be used in conjunction with other sensors. We used the Velleman MK120 IR Light Barrier kit. Schematic is here. Buy it here. This worked quite for sensing liquids and solids passing by. The IR beam reflects off anything coming down the pipe. This will be recorded as a 'flush' event. The IR beam will flicker on/off so some filtering would be required for this to convert the data stream into a single 'flush'. The Velleman kit flashes the IR at a particular frequency. Only this frequency is monitored, which helps to stop 'false' readings. This will probably need to be implemented in software/hardware. The IR sensor was the most reliable of the detection methods tried. Note : The piezo sensor was discounted at an early stage due to low sensitivity to mild vibration. 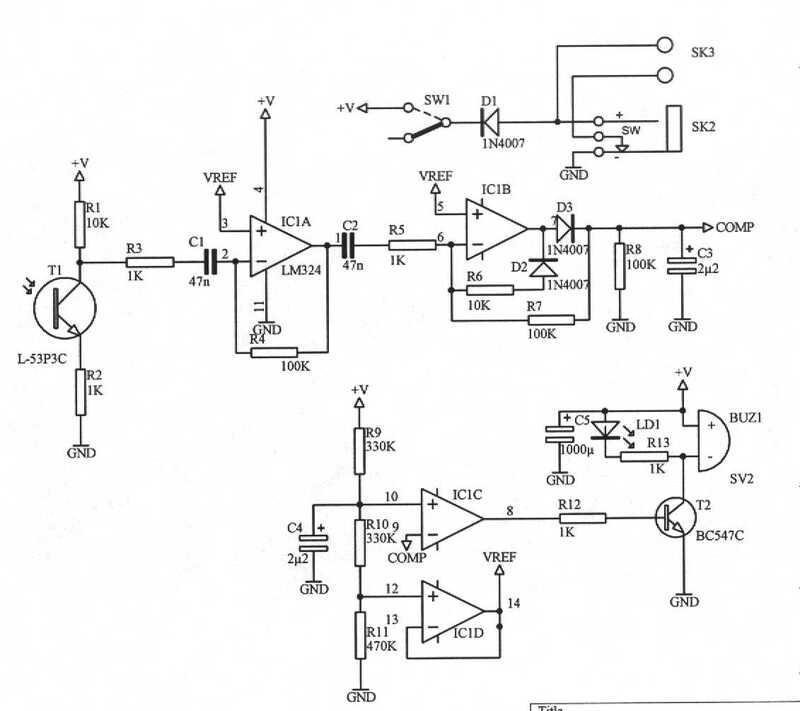 A standard electret microphone amplifier circuit was built using a TL081 op-amp. The output waveform was measured with an oscilloscope. While the principle of detection with sound/vibration is good, in practice the complexity of designing a robust solution renders this idea impractical. Node is placed in the tank. It sends data up to the recorder (Dataduino) via a serial connection at 4800 baud. The recorder has been set into low-power mode. This is only woken when data is received on the Rx of the serial line. To do this there have been a couple of changes to the DataDuino circuit. The clock output from the RTC is not needed as the interrupt, so this track has been cut. The device should wake when data appears on the Rx, so I have connected the Rx to D2 (Interrupt 0) with a 330 ohm resistor. When data is sent on the serial line then it wakes up the unit for <5 seconds. Data will be sent in the LLAP format, which is basically a 12 char string, starting with 'a' then a 2 char ID then 9 chars of information. --any data--- just wakes the unit up. The <CR> (carriage return) sets the data starting point. The LLAP format data can then be sent. This is only recorded if it matches the correct format, otherwise it is discarded. Data is reocrded with a timestamp to a human-readable .csv file on an SD card. The recorder takes around 4-5mA. It required 3.5-5V supply. A pack of 3 x AA batteries (2000mAh) would last around 400hours = 16 days. A pack of 3 x D batteries (12000mAh) would last around 2400hours = 100 days. The power supply is probably best as a recharged power pack. This could cope with grid-intermittency. So a pack of 3 x D or C cells, with a re-purposed mobile phone charger would proabbly be best (and phone chargers relatively available in lots of places for the lcoal grid. This project is managed on Trello. This page was last modified on 18 March 2019, at 12:21.